Imperator Caesar Marcus Aurelius Antoninus Augustus (April 26, 121 – March 17, 180) was emperor of Rome from 161 C.E. until his death in 180 C.E. He was notable among Roman emperors as devoted to the study and practice of philosophy and to the wise administration of the empire. Marcus also served as a priest to the Roman state religion, yet generally accommodated the diverse religious practices that existed throughout the Roman world. The influence of the early Christian Church became widespread during his reign, although Marcus uncharacteristically permitted severe persecutions in some provinces. 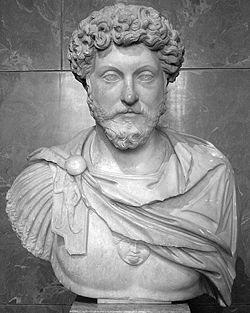 While Marcus was young, Emperor Hadrian arranged his adoption by Antoninus Pius, so that he would be in the direct line of succession. After becoming emperor, Marcus spent most of his reign in a protracted military campaign against the Germanic tribes to the north. Marcus was a temperate and just ruler who defended the Roman Empire against numerous threats on its borders. He is considered the last of the Five Good Emperors; the decline of the Roman Empire is thought to have begun during the reign of his son Commodus. Marcus' writings were exercises for his own improvement rather than philosophical treatises. He was deeply influenced by the Stoic philosopher Epictetus, and his Reflections and Meditations stress moral improvement, ethical citizenship, philosophical detachment, and more generally the place of man in the cosmic order. These works are valued as a literary expressions of virtuous public life and civic duty. Historia Augusta identifies him in its heading as "Marcus Antoninus Philosophus" ("Marcus Antoninus the Philosopher"). Toward the end of the work, the following is reported about him, "sententia Platonis semper in ore illius fuit, florere civitates si aut philosophi imperarent aut imperantes philosopharentur" (27.7) ("Plato's judgment was always on his lips, that states flourished if philosophers ruled or rulers were philosophers"). He was born Marcus Annius Catilius Severus on April 26, 121 C.E., to an aristocratic family of Spanish descent. His grandfather was elected consul three times, and served the Roman Emperor Hadrian as a city prefect. As a youth, Marcus was a serious student and received public honors at an early age. Emperor Hadrian took an interest in Marcus as a possible future successor, and he required Antoninus Pius, who succeeded him as emperor, to adopt young Marcus, along with the son of another candidate, L. Ceionius Commodus, who predeceased Hadrian. Marcus was 17, and L. Aelius Aurelius Commodus (Verus) was eight. From then on, Marcus was known as Marcus Aelius Aurelius Verus. The reign of Antoninus Pius was long and relatively peaceful; disturbances on the fringes of the Roman Empire were quickly resolved by the provincial legates. Antoninus Pius never left Italy and never exposed Marcus or Verus to military life. Marcus Aurelius rose steadily through the Roman political ranks. He was a consul in 140 and 145, received the tribunicia potestas in 147, and served as a magistrate and priest. He continued his studies, and was well acquainted with Fronto (c. 95 – 160), the distinguished rhetorician and orator, and with other thinkers such as the Athenian Herodes Atticus, and Aelius Aristides. The writings of Epictetus impressed him deeply and he became a firm Stoic. Aurelius married Faustina the Younger, daughter of Emperor Hadrian, in the year 145. During their 30-year marriage, Faustina bore 13 children, most notably, his son Commodus (161-192), who would later become emperor, and his daughter Lucilla, who was first wed to Lucius Verus to solidify his alliance with Marcus Aurelius, and after Verus’s death, married to Claudius Pompeianus Quintianus of Antioch, an important associate of her father. Faustina was often the subject of gossip, accused of employing poison and of murdering people, as well as being free with her favors. Marcus defended her vigorously. She accompanied him several times to the battlefield and was honored with the title mater castrorum. In 175, she died in an accident while with him at a camp at Halala in southern Cappadocia. Marcus dedicated a temple in her honor and renamed the town Faustinopolis. In 161, Emperor Antoninus Pius died after indicating to the Roman senate that he wished Marcus Aurelius to be his successor. Marcus accepted on the condition that he and Commodus be made joint emperors, as Hadrian had planned. Almost immediately there was a threat to the Roman Empire from Parthia, to the east. Taking advantage of the uncertainty brought about by the death of Antoninus Pius, the Parthian monarch, Vologaeses III, put one of his henchmen on the throne of Armenia, which acted as a buffer state between Rome and Parthia, and rebuffed the Roman forces who tried to obstruct him. As a symbol of Roman imperial prestige, Marcus decided to send his adopted half-brother to the front, surrounded by some of the best Roman generals. The campaign was very successful; a number of Parthian cities were destroyed, Parthia capitulated, and Rome placed her own king on the Armenian throne. Lucius Commodus Verus returned to Italy victorious and was awarded a triumph, unusual because the parade included Verus, Marcus Aurelius, their sons and unmarried daughters. However, the returning Roman troops brought with them a terrible plague, which had a devastating effect on all the Roman provinces. Early in 169, Germanic tribes launched an invasion of Italy from the north. The Marcomanni and Quadi crossed the Danube, penetrated the intervening provinces, and entered Italy. Marcus Aurelius and Lucius Verus quickly mobilized a large force and went north to defend Italy. Verus soon died on campaign, and Marcus brought his body back to Rome and gave him full honors. He then returned to the northern frontier, where he was to spend most of his remaining years. The Roman strategy was to drive the Germanic tribes out of Italy and back across the Danube. This was to be accomplished by isolating each tribe and defeating each one individually. The strategy was successful but required time and resources. Two new legions were recruited and many new camps and fortresses had to be constructed. One by one the tribes were defeated and brought under Rome’s dominion. In 175, the distinguished general Avidius Cassius, governor of Syria, attempted to take over the Roman Empire, and Marcus Aurelius traveled to the east. Avidius died before he arrived. Marcus spent some time in Athens and was initiated into the Eleusinian mysteries. He then returned to the northern front, taking his 16-year-old son and intended successor Commodus. In 180, while on campaign with Commodus in the north, Marcus became ill. He refused food or drink, and died a few days later, on March 17, in Vindobona, then a Celtic village, near present-day Vienna. His ashes were brought back to Rome to rest in Hadrian's mausoleum (modern Castel Sant'Angelo). The military campaigns against the Germanic tribes were succeeding, and Marcus had advised Commodus that one more year of warfare was necessary in order to attain complete victory and fully establish Roman dominion. Instead, Commodus chose to withdraw from the campaign, a decision which later proved disastrous to the Roman Empire. Marcus Aurelius' death is said by many historians to have been the end of the Pax Romana. Marcus Aurelius’s reputation as an exemplary ruler has survived until present times, partly because of the Meditations, which testify to his integrity and personal devotion to duty. The life he chose was one of self-sacrifice and public service, and much of his time as emperor was spent in military camps, in an effort to establish the peace and security of the Roman Empire. Marcus Aurelius was an able administrator, who selected capable men for important posts and knew how to make the best use of their abilities. He continued the system of social mobility established by his predecessors, which allowed men from the provinces to advance into the Roman aristocracy. He centralized his government, and placed judicial matters in the hands of iuridici, who spoke with the authority of the emperor. Marcus was a thinker and a student of philosophy, but he also served as a priest and gave full respect to the state religion. He acknowledged the validity of other people's beliefs, and accommodated the variety of religions that existed throughout the Roman Empire. Christianity was not restricted by any official policy and the influence of the early church became widespread during his reign. However, he did not interfere when local governments incited violence against Christians. Marcus Aurelius sculpture on Capitoline Hill. Marcus Aurelius was the last great Stoic author. While on campaign between 170 and 180, Aurelius wrote his Meditations, comprising 12 books of private reflections, written in Greek, on the meaning of life and death, the cosmos, duty, and public life. The books are not organized in any particular order, and appear to be written for his own guidance and self-improvement. The books illustrate how Stoic thought could be applied by someone at the height of power. Marcus was deeply influenced by the teachings of Epictetus and showed great interest in the psychology of moral improvement. He also remained firmly committed to the Stoic concept of natural order and man’s place in it, and exhibited a religious sensitivity and a sense of man’s insignificance in the cosmos. He reflected often on the duties inherent in being part of the social order. The book itself was first published in 1558 in Zurich, from a manuscript copy that is now lost. The only other surviving complete copy of the manuscript is in the Vatican Library. It is available in numerous translations and is still revered as a literary monument to a government of service and duty. It has been praised for its "exquisite accent and its infinite tenderness" and "saintliness," being called the "gospel of his life." Marcus Aurelius erected only a few monuments during his reign, possibly because so many resources were needed for military campaigns. Marcus and Verus erected a column in honor of the deceased Antoninus Pius, the base of which is now on display in the Vatican Museum. Three arches were raised to commemorate their military successes, one for Verus and two for Marcus Aurelius. Sections from one of these are now preserved on the Arch of Constantine, and three refiefs from another are in the Conservatori Museum on the Capitoline Hill. The most well-known monument is a column in the Piazza Colonna that commemorates Marcus’s campaigns from 172 to 175. 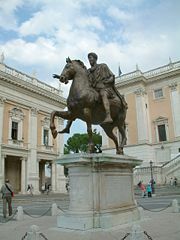 A well-preserved bronze equestrian sculpture of Marcus Aurelius, which, during the Middle Ages, had stood in the Lateran Palace in Rome, was relocated in 1538 to the Piazza del Campidoglio (Capitoline Hill). Currently, the original is on display in an exhibition room designed especially for this purpose in the Palazzo dei Conservatori of the Musei Capitolini, while a copy has replaced it in the square. It escaped destruction, following Rome's conversion to Christianity, because it was mistaken for a statue of Emperor Constantine. According to medieval accounts, a small figure of a bound barbarian chieftain once crouched underneath the horse's front right leg. 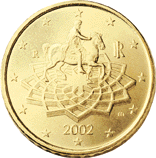 Italian Euro coin depicting Marcus Aurelius sculpture on Capitoline Hill. This statue is the subject of a €0.50 Italian euro coin designed by Roberto Mauri. Anonymous, Briley A., trans. Lives of the Later Caesars: The First Part of the Augustan History with Newly Compiled Lives of Nerva and Trajan. London: Penguin Classics, 1976. Bowersock, G. W. Greek Sophists in the Roman Empire. Oxford: Oxford University Press, 1969. Champlin, E. Fronto and Antonine Rome. Cambridge, MA: Harvard University Press, 1980. Farquharson, A. S. L., and R. B. Rutherford, trans. The Meditations of Marcus. Oxford University Press, 1998. Gibbon, E. The Decline and Fall of the Roman Empire, vol. 1. London: Everyman’s Library, 1993. Hammond, M. The Antonine Monarchy. De Gruyter, 1975 (Rome, 1959). Long, A. A. "Epictetus and Marcus Aurelius," in T. J. Luce, ed. Ancient Writers II. New York, 1982: 985–1002. Perowne, S. Caesars and Saints. London: W. W. Norton, 1962. Rutherford, R. B. The Meditations of M. Aurelius: A Study. Oxford: Oxford University Press, 1989. Stanton, G. R. "Marcus Aurelius, Emperor and Philosopher," Historia 18 (1969): 570–587. Stanton, G. R. "Marcus Aurelius, Lucius Verus, and Commodus: 162–172," in ANRW II 2. Berlin/New York, 1975: 478–549. Weber, W. "The Antonines," in CAH XI. Cambridge, 1936: 325–392. Mémoires d'Hadrien (1951) was a fictitious but plausible autobiography of one of his predecessors, Hadrian, in the form of a series of letters directed to his adoptive grandson "Marcus," written by Marguerite Yourcenar. This page was last modified on 13 August 2018, at 16:28.